The process for managing air and ocean shipments is appallingly inefficient and inflexible. It relies on an army of clerks to manually enter and share data, via emails and spreadsheets, among shipping partners – suppliers, forwarders, carriers and customs agents. 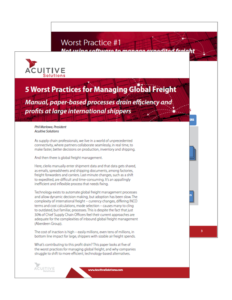 This paper examines 5 of the worst practices that add time, labor and enormous expense for high-volume global shippers, particularly those that rely on air freight. Download the paper to learn the true costs of manual, paper-based processes – and how you can fix them.